As a cultural anthropologist, my focus has been on the behavior of the group and on organizational cultures that can lead otherwise good and decent people to behave in cruel and inhumane ways given certain patterned and predictable features of mobbing and how people respond when a leader targets someone for punishment. Here is what the Commission on Bullying is doing to "propose public policy recommendations and legislation necessary to protect tenants from harm and preserve their rights." (3) We enjoy participation by representatives of a wide range of legislative committees and administrative agencies, including elder affairs, disability, mental health, the attorney general, and housing. In our deliberations we have input both in person and by interviews and testimony from landlords, managers, social workers, tenant advocacy groups, and police as well as advocates for the elderly and disabled. The Research Committee on Conditions and Prevalence of the Commission is working with legal and housing professionals, advocates, and residents. We are workintg to identify the conditions that may allow or inhibit bullying. When we understand these "causes" of bullying, we can begin to create remedies. These research efforts will provide a guide to the factors that can make a difference, empowering communities to devise their own solutions, and helping to guide policy and legislation, but it can't lead to a universal recipe for success. programs that are in transition, with ongoing efforts to diminish and prevent bullying. Comparing and contrasting examples of such communities can help clarify what works and what doesn't. The Commission will soon distribute a survey designed to learn more about the various combinations of factors and conditions that enable bullying in housing and to get a sense of the extent of bullying in the Commonwealth. The survey design has benefitted from input from residents and advocates as well as from people in the management and administration of housing, and of course many Commissioners. Linn Torto, Chairwoman of the Commission, Laura Taylor and Cate Mingoya of DHCD, and Dave Eng of MassHousing have each played an important role, with support from Michael Kelleher. Many residents and advocates report that today, despite the existence of laws and regulations, there is no effective, reliable way to hold landlords to account when the bullying and mobbing are out of control;and there is no way to get immediate protection and relief for a victim. There are numerous barriers to justice for victims of bullying who cannot afford to obtain professional legal counsel. Frustrated victims of bullying ask, "What is the point of laws and regulations if poor elderly and people living with disability are unable to be protected and to challenge injustice?" The police and agencies charged with protecting the elderly or the disabled from abuse lack the authority and mandates to intervene to protect victims of bullying. Landlords, tenants, and agencies are frustrated by the difficulty of balancing the rights of a person living with disability or disease who may inadvertently interfere with the rights of others. 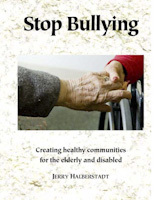 As part of the Commission research into the conditions or causes of bullying, I have opened a discussion to include attorneys, advocates,and residents to explore the realities and complexities of the legal and administrative remedies needed to protect elderly and disabled residents from harm and to assure their rights. We will welcome input from landlords, managers, police, social workers, and mental health professionals. We need to find out what each group can contribute and what new resources they need: training? personnel? laws? regulations? We will ask if are today effective ways to encourage, support, and require that the housing providers and their agents fulfill their legal responsibility to assure peaceful enjoyment. And because the victims of bullying experience significant social and psychololgical harm, we need to see ask if there are readily available protections and remedies that can provide immediate relief. If we discover workable and effective remedies that residents can access without cost, we will make that information available. If such remedies and protections do not exist, we will recommend new legislation and/or regulations. Sorting out the competing rights and obligations of landlord, management, people living with disability, victim, and perpetrator will require thoughtful care. Recently, Jonathan Gale and I participated in meetings of the Best Practices Committee led by Commissioners Michael Kane (Executive Director, Mass Alliance of HUD Tenants) and Robin Krawczyk, MSW, LICSW (Community Education and Training Specialist, Services for OlderAdults, Jewish Family & Children’s Service). We were impressed by the hard work and good analysis that is going into their work. Good job! I am humbled by the hard-won wisdom and experience of our partners and I learn so much from them, and take strength from their examples. At the initiative of Betty Rae, an officer of the Resident Advisory Board (RAB) of the Boston Housing Authority, I was honored to present a workshop on bullying to the officers of the Resident Advisory Board. The Resident Advisory Board had helped the Coalition in advocacy for legislation to create the Commission onBullying. On the way to the meeting in a public housing building, I walked through a neighborhood of stately old homes with well-tended gardens, an attractive place to live. But as I approached my destination, there was a police cruiser and a TV van. There had been shots nearby. We may only see news reports of shootings on a daily basis, but some of the tenant advocates in Boston live in what is a war zone; bullying is not the worst problem they face. I presented an update on the work of the Commission. I admired what Georgia, one of the RAB officers, had done. Decades ago, she fought for legislation to protect children from lead poisoning. I learned about the current problems in BHA housing and the courage of these leaders who stand up against bullying. I was moved by their feelings of frustration and their determined strength; and the session redoubled my determination to find a way join forces to help. I believe that we need to recognize that bullying and mobbing of elderly and disabled residents of public and subsidized housing is a systemic problem. The Massachusetts Commission on Bullying is today working to understand the causes of bullying and to propose possible remedies to the legislature. Let us all work with the Commission and support their findings as a first step in bringing relief, and continue to advocate for constructive change. We have just begun the struggle for our rights and for respect. (2) Harper, Janice, Bullying and Mobbing in Group Settings, Statement presented to the Massachusetts Commission on Bullying, August 7, 2017.